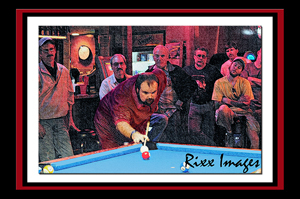 Several photos on this page are courtesy of Rixx Images. Rick does fantastic photographic work. Please visit his website for more info. Tom is a 10-1 rated player out of Tucson. 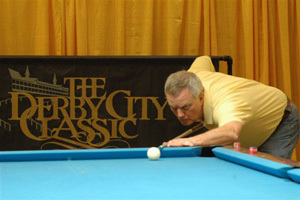 Here he's shown playing in the 2007 Derby City Classic. When I purchased my "MBA CUE" from Nickerson cues, I enjoyed the entire process. 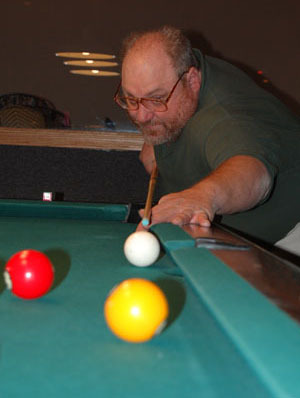 I personally have five main requirements that I look for when I purchase a custom cue stick. - The final requirement and the most important is customer service after the sale. I am very satisfied Keith fulfilled all five requirements in a professional manner. Keith made the custom cue buying process very easy and rewarding for myself. I felt Keith did not just make me a custom cue but he built a relationship with me. I have played with dozens of other cue brands in the past. I feel my current Nickerson cue is one of the best I have ever played with. I noticed and enjoyed the level of focus and commitment shown at all times at Nickerson cues. Please feel free to e-mail me with any questions you may have about my Nickerson cue purchase. 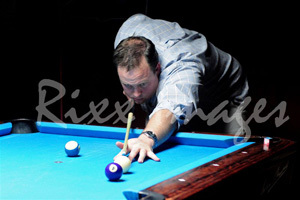 Carl is pictured playing in the first stop of the 2008 Arizona Desert Classic Tour. He recently received his MBA and commissioned me to build his cue in celebration of that event. Carl is also a very good (Certified BCA Instructor) in Tucson, Arizona. I love my Nickerson cue! Keith Nickerson is a craftsman and a wood worker first and it shows through with the finished product. My cue, as every cue I have seen Keith create, is perfectly balanced for a great, smooth stroke. It has a hit that is true and gives the feeling that it is part of my arm. I have played with many of the big name cues; both production cues as well as custom cues and you can have them all. I'll take my Nickerson cue over them any day. Please feel free to contact me with any questions I can answer for you about Keith Nickerson and his custom pool cues. My email address is Jack@ABMurray.com or call me at 520-404-5533. -------------------------------------------- Jack is pictured here participating in the 2008 Arizona Desert Classic tour. In addition to the shooting cue shown at the top, he also uses a custom built Keith Nickerson Purple Heart jump/break cue. I am truly impressed, inspired, and amazed every time I pick up my Nickerson Cue. None of the cues I have used in the past have played as well or have been as comfortable as my Nickerson cue. With having Cerebral Palsy and playing pool, sometimes I am not sure which gets more noticed, me or the cue. I used to play with a Predator cue and now with the help of my Nickerson I feel my game has jumped to another level. Rob was also named National APA player of the month for May/June 2007. He has been playing pool for the better part of 26 years, the last 10 seriously.